Since 2014, British brand Organii has been creating bathroom essentials that contain only pure, 100% natural ingredients sourced from organic certified suppliers where possible. From soaps and shower gels to dental care and sun protection, there are 16 different products to choose from – at really affordable prices. There are six shower gel scents to choose from: Aloe Vera & Bamboo, Argan, Liquorice, Peach, Shea Butter or Strawberry. 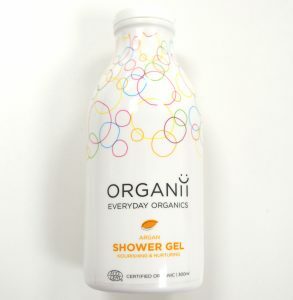 I tested the nourishing and nurturing Argan Shower Gel, which is free from nasties such as parabens, SLS, PEG, colourants or synthetic perfumes and it’s completely suitable for vegans (as are all of Organii’s products). 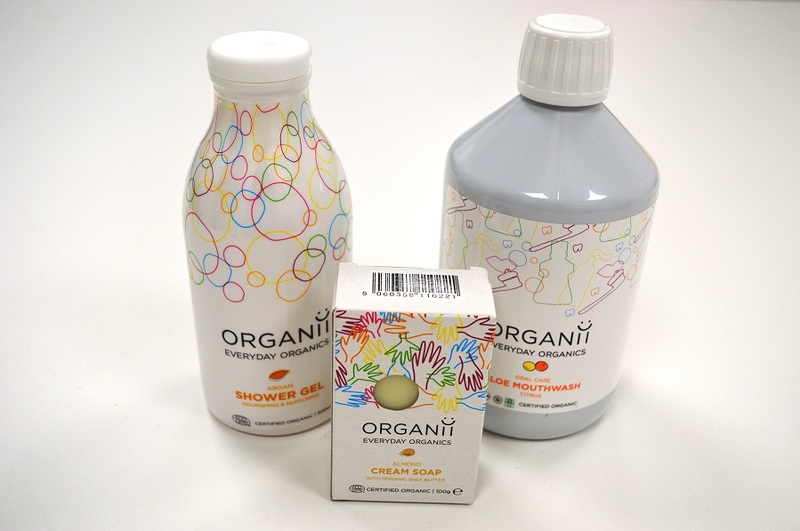 The packaging is really unique, and looks like a little milk bottle – with a colourful bubble-like design at the top of the bottle. The lid flips up, and you do have to squeeze the bottle quite firmly for the gel to escape, which I like as it stops too much from coming out at once and helps you to avoid waste. The first thing I noticed was the scent, which smells strongly of indulgent Argan Oil and lingers subtly on the skin nicely for hours after showering. This shower gel also foams up really well without the use of SLS or other chemical foaming agents, and feels silky smooth on the skin during use. 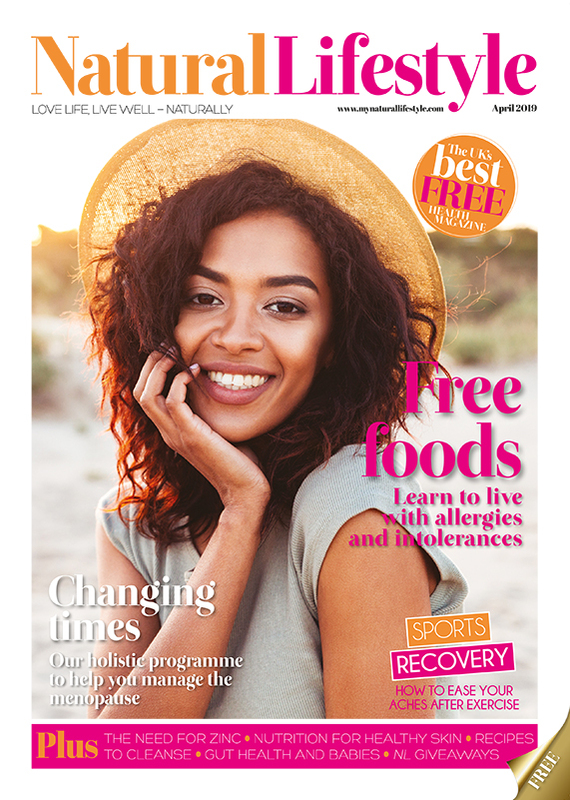 I even found out that my boyfriend has been pinching the shower gel for his own use – and in a recent bout of sunburn found that it really soothed his (very) red skin, which is a great bonus. This was my favourite of all of the three products I tested. Like the shower gel, there are six organic Cream Soaps to choose from: Wild Rose, Lavender, Lime Blossom, Vanilla Cream, Almond and Fragrance Free. I tested the Almond Cream Soap, and I absolutely adored it. 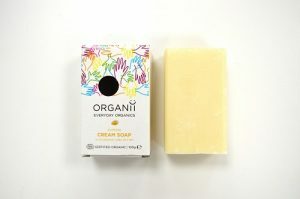 It does exactly what it says on the tin – the almond scent is lovely, and the creamy bar lathers up really well. Almonds are known to nourish and moisturise, and it left my skin feeling really soft after use. If I were to be really picky, the only thing I would say is that on first use the bar has very sharp corners and can be tricky to manoeuvre – but after a few uses the edges round out nicely. The soap lasted a couple of months with daily use, so for £2.65 you really can’t go wrong! I’d definitely like to see what the other fragrances are like, especially Wild Rose. Scarily, brushing your teeth alone cleans only 25% of your mouth – so using mouthwash is a great way to maintain healthy teeth and gums. The problem is, traditional mouthwash tends to be full of chemicals and can even do damage to your mouth. 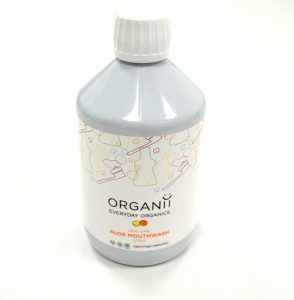 Thankfully, there are natural alternatives out there – like Organii’s organic mouthwash, which is formulated with antiseptic Aloe Vera gel and offers a natural way to fight bad breath and gingivitis, while preventing plaque and tartar build up. The mouthwash comes in two flavours, Citrus and Eucalyptus, which promise to be refreshing and uplifting. I tried the Citrus flavour and, although I was slightly apprehensive at first, I really liked it. The orangey flavour is subtle but really lovely – and while it does contain organic alcohol (free of pesticides and fertilisers), you cannot taste it at all. After use, my mouth did feel nice and clean – however I did miss the mint flavour that so many of us associate with freshness. Nevertheless, I would highly recommend this mouthwash to anyone looking for natural and organic alternatives for dental hygiene – and for £5.95 you get an absolutely huge bottle that lasts a long time. Overall, I think all of the Organii products offer really luxurious-feeling products at great value for money. My soap has only just run out and I still have lots of the mouthwash and shower gel after using them regularly for two months, and will definitely be replacing them when they’re all empty – if I can decide which of the lovely fragrances to choose from!